US$1.4 billion through a credit line and budgetary support as the tiny island nation’s new government pivots from a pro-China foreign policy to one focused on its close neighbour India’. Prime Minister Modi was quoted as affirming that ‘both nations have agreed not to allow their territory to be used against each other’s interests. Such mutual policies do not align with previous foreign policy of the Maldives which had privileged China as a development partner over India. While there is expressed opinion that this changing behaviour of the Maldives is under benevolent influence of India, there is also more to this story considering the independent foreign policy stance taken by the Maldives in recent past. In view of contributing to this evolving debate, this article promotes a constructivist approach to foreign policy analysis to explain a non-traditional aspect of regional politics in terms of explaining the independent foreign policy decisions made by a rather small island state like the Maldives in forming regional alliances (see Flockhart, 2008; Rasheed, 2018). This leads to an implication that traditional theories of international relations including neorealism and neoliberalism may not fully explain how Maldives chose China over India during its former president Yameen’s term. This article claims that military and strategic factors are not the only determinants of regional politics concerning the Maldives and its relations with India or China (Rasheed, 2018). It aims to show that foreign policy of the Maldives is not directly shaped by regional politics of larger states and their military and strategic interests, but rather as a construction of the intersubjective understanding between the Maldives and those larger states including India and China. The Maldives’ experience with China during the former government presents an empirical case for this ideational model where their foreign policy statements can be used to identify and explain what ideas and how those ideas are shared between the two states to shape foreign policy and regional politics. Concluding suggestion is that same ideas have changed with the change of government and temporally shaped its new foreign policy objectives in favour of India. However, this change of policy choice is not shaped by India’s role in regional politics, but by shared ideas to cooperate. The Maldives has established enhanced relations with China. China introduced the One Belt, One Road (OBOR) initiative in 2013 (Das, 2017). From 2014, the then Maldivian president Abdulla Yameen and Chinese president Xi Jinping exchanged state visits that became a new dawn of enhanced diplomatic relations and economic partnership between the two states, instigating mega development projects in the Maldives involving over US$200 million bridged project that connects the capital city island, Malé with the international airport island, Hulhulé and a US$800 project to expand Ibrahim Nasir International Airport (Rasheed, 2018). In addition to technical support in the area of education and social infrastructure development, China has established enhanced links with the tourism industry–primary source of income in the Maldives, which have been magnified by the growth of Chinese tourists visiting over recent years. Maldives has signed a free trade agreement (FTA) and joint action plans that have allowed almost unlimited exchange of investments for China to run in the Maldives (Chung, 2018; Rasheed, 2018). Today, China accounts for at least 20 per cent of all tourist arrivals in the Maldives as opposed to 16 per cent and 10 per cent of its traditional visitors from Western Europe and northern Europe respectively. In numbers, Chinese tourists reached about 300,000 during 2017 – in comparison, the population of the Maldives is barely 400,000. A Washington DC-based think tank, the Centre for Global Development, reported that China’s project to upgrade the international airport cost around US$380 million and the development of a new population centre and bridge cost around US$400 million. Their report further stated that the World Bank and IMF considered the Maldives to be at ‘high risk of debt distress and is currently being buffeted by domestic political turmoil’. The Centre for Global Development estimated China’s loans to the Maldives at US$1.3 billion, which is more than 25 per cent of its gross domestic product (GDP). The new government elected in November 2018 was yet to find out the exact amount in monies the Maldives owes to China. News/Talk 550AM 95.1FM & 99.9FM reported the former president Mohamed Nasheed, now the adviser to the new government, as saying that ‘Chinese ambassador [to] the Maldives handed the government an invoice for US$3.2 billion’, which China denies and says ‘the number is close to US$1.5 billion’. Nasheed was quoted as commenting that ‘we are at a loss to understand how much we really owe to China. Direct debt or direct bilateral government-to-government debt is one thing, but there is on top of that sovereign guarantees for the private sector’. To this end, it is not clear how much the country owes China. China rejected the language used in media claiming the information as ‘untruth’ and ‘deeply exaggerated’. This sense of disputed language exchanged between the two states also predicted present relationship uncertain, although there were expressly stated intentions shared between the former president Yameen and China’s president Xi when they signed agreements to support the development and respect internal affairs of both states (Rasheed, 2018). Moreover, the Maldives is yet to define its new foreign policy attitude towards China as it endeavours to address changing domestic political circumstances, check and balance the activities of the outgoing government, and revitalise the long-held historical relations with India that had almost gone grey as the Maldives took its journey with China (Rasheed, 2018). Impact of Maldives-China relations on regional power politics is explained by India’s engagement with the Maldives in regional context. India has historically played an instrumental role in shaping the power dynamics of South Asia (Ganguly & Scobell, 2005; Jahangir, 2013; Thomas, 2004, Rasheed, 2018). India has always supported and been the first to aid development in the Maldives in times of crisis. The Maldives and India not only hold diplomatic ties, but also have been close neighbours and friends since the early days of their independence from the Western colonisers in South Asia. However, until recently, India was concerned about strategic consequences of the increasing investment of China in their regional territory. India has not formally condemned or expressed fear over Maldives-China relations during former president Yameen’s term (2013–18). However, it was concerned about the idea of China’s growing expansionism in South Asia region. In this respect, China’s engagement in the Maldives is seen as part of its ‘string of pearls’ policy which, by many international relations scholars including Professor Brahma Chellaney at the Centre for Policy Research in Delhi, has been related to the strategic position of China in Indian Ocean. In February 2018, a Chinese naval fleet was allegedly spotted on the South Asian territorial periphery of the Indian Ocean. This became a strategic concern for India, as that had a buffer effect against India’s authority to address a political crisis in the Maldives aroused out of a series of arbitrary arrests, declaration of a state of emergency and the army’s intervention in the Supreme Court. Covering the February 2018 political crisis, The Diplomat reported that ‘the [political] stakes in Malé [capital of Maldives] have come to attract great interest in both India and China. Amid their ongoing competition for strategic presence in the Indian Ocean, the fate of the Maldives after this crisis is far from an irrelevant outcome’. The Diplomat reported that ‘Delhi is worried about Beijing’s mounting influence over Maldives and the strategic implications for India’. Especially during February 2018 crisis, India’s worry was exacerbated as its capacity to intervene local politics of the Maldives was challenged by the military presence of China in the South Asia region. Reportedly, India attempted to convince the Maldives to take regional strategic matters into consideration when engaging with China. Especially after the Maldives signed the FTA with China in late December 2017, India reminded the Maldives of its regional priorities. India’s ministry of external affairs spokesperson was quoted commenting that ‘[India and the Maldives have] strong historical and civilizational linkages, and also at the people-to-people level … It is our expectation that as a close and friendly neighbour, Maldives will be sensitive to our concerns in keeping with its India first policy’. Despite this, the Maldives had continued with a bias alliance with China while keeping with its traditional ‘India first’ foreign policy. both countries have worked very closely on a number of fronts. Trade, investment and people to people exchanges have shown remarkable growth, enabling the two nations to forge closer economic ties at unprecedented levels. China always sees the Maldives as its close friend and sincere partner. The Chinese side always respects the independence, sovereignty, and territorial integrity of Maldives, and respects the political systems and development paths chosen by the Maldivian people based on their own national condition. we have been caught up in this new way that the world is looking at China. There has been tension and pressure on the Maldives … the talk of debt traps, land grabs in the nation is because we have been working with China. If we were working with India or the US, people would not be talking. Although India was concerned about any strategic impact on regional power politics, the Maldives and China were convinced that their partnership was not necessarily shaped by their strategic position in South Asia region. Moreover, political and economic ideas were shared between the two governments on economic terms to meet mutual benefits, instead of relative gains by competing with India. Ideas that shaped the Maldives-China relations were rooted both in China’s OBOR principles and political beliefs held by former president Yameen and his administration about sovereign rights, development cooperation and regional foreign policy. In a joint statement by both states, president Xi reiterated that ‘China will commit itself to establish friendly and cooperative relations with the Maldives based on the Five Principles of Peaceful Coexistence [FPPC]’. FPPC entails ideas about cooperating on mutual terms and respecting principle of non-interference in each other’s internal affairs. These ideas can be drawn from China’s foreign policy statements and OBOR initiative (Flockhart, 2008). The OBOR initiative launched China’s twenty-first-century development agenda for global connectivity. The main ideology of the initiative reflected the transformation of China from a poor and weak economy to the second-largest economy worldwide, and declared its political and policy priorities to ensure a consolidated approach to development (Chung, 2018; Haibing, 2017). Characteristically, its development cooperation and partnership were based on the principle of non-interference that does not impose political conditions on the internal affairs of its partnering states (Yanbing & Ying, 2012). The Maldives has shared similar ideas about state sovereignty. The Maldives has an economy that is predominantly capitalised by the tourism industry with fast growth potentials. The Maldives won independence from the British in the 1960s and rapidly gained economic importance from the late 1970s as tourism flourished internationally, recognised by the Global Time Annual Survey in 2014 as one of the ten most popular destinations to travel, ‘ranked in fifth place, with Switzerland, Japan, France, Hungary making the top four’. The state is socially stable and economically forward-looking; however, it accommodates historically-transmitted political practices shaped by ideas of tyranny and dictatorial rules, which kept appearing and reappearing even after democratic reforms were instigated in 2008 (Rasheed, 2013). Today, we have moved our national strive beyond our boundaries, into the international arena to compete with professionals and experts of international stature. Today the national debate should be about whether we, as a nation, have what it takes to strive and win the international race. these organisations and associations sometimes act as policeman, criticizing and penalizing small nations over events that occur in small nations … There will be no stability if one country can interfere in another’s internal affairs and there are not many things the UN can do when such interferences occur. The stringent foreign policy attitude and isolationist behaviour, particularly against Western ideas, were apparent when it decided to exit from the Commonwealth ‘for treating the government in power “unjustly”’ (Rasheed, 2018). These ideas aligned with principles of non-interference and respect for the internal affairs of states. It was opportunistic for the Maldives to partner with China (Rasheed, 2018). However, that decision was shaped by ideas held and shared between the two governments for mutual gains rather than to compete with India or challenge regional politics under benevolence of China. In a constructivist viewpoint, the China foreign policy of the Maldives was shaped by the ideas shared between the two countries to cooperate for mutually benefits, strictly based on non-interfere in either’s internal affairs. Hence, their relational impact on regional power dynamics (and vice versa) can be explained as a construction of intersubjective understanding between the two states, rather than a response to any threat from India or an attempt to seek the benevolence of a greater economic power. Former president Yameen was quoted as saying that the ‘Maldives had assured India and other neighbouring countries that it would keep the Indian Ocean a demilitarized zone’. Against claims about security interests and acts of benevolence during February 2018 crisis, China expressed confidence that ‘the Maldives has the capability to protect the security of Chinese personnel and institutions in the Maldives with all-out efforts’, that it ‘believes that the Maldivian government and people have the wisdom and capability to properly handle the current problem and resume the normal national order in accordance with the law’ and ‘that China will not interfere in the internal affairs of the Maldives, and this is also a basic norm of international relations enshrined in the UN Charter’. India may have seen reported naval activity of China in the Indian Ocean as a threat. This does not necessarily have an effect on foreign policy choices of the Maldives. The then government has seldom changed its attitude towards China, not because it feared India; but this was based on the intersubjective agreements or ideational conventions built on shared ideas that China supports the political and economic interests of the Maldives. Ideas acted as conventions that have managed what the Maldives has expected from its development partners (see for examples of constructivist approaches of Blyth, 2002; Flockhart, 2008). These ideational conventions coordinated expectations of the Maldives and China about their relational impact on regional politics. In the February 2018 political crisis, the then government was inclined to act stringently to serve its political purposes. It did not want external interference in its affairs. That China did not comment against the government’s decision made it ideationally more appealing for the Maldives to align with China. China merely stated that the ‘Maldivian government and people have the wisdom and capability to properly handle the current problem’. A Chinese government spokesperson was quoted stating that that ‘China believes that the relevant disputes arising in the Maldives are the internal affairs of that country and should be properly resolved through dialogue and negotiation by various parties in the Maldives’. Reportedly, China went as far as saying that India ‘has no justification for intervening in the Maldives crisis’. Conversely, the Indian ministry of external affairs’ statement expressing its ‘expectation that the government of Maldives will not be seeking extension of the state of emergency so that the political process in Maldives can resume with immediate effect’ would not have been appealing as this attitude did not meet the interests of the then Maldivian government. India’s appeal back then did not align with political ideas of the Maldivian government. The obvious change of thought occurred when the new government took office in November 2018. 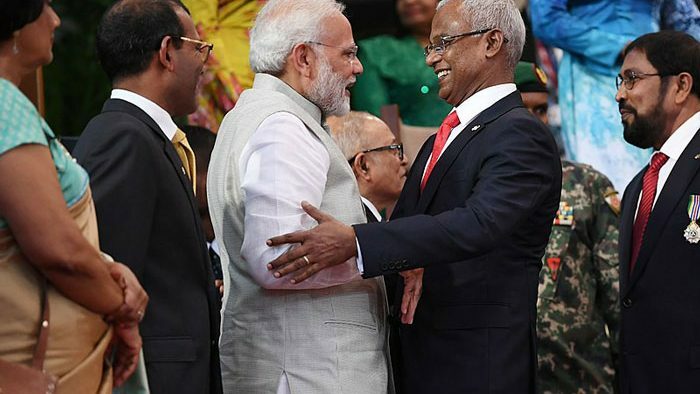 The visit of the prime minister of India Modi, to the Maldives, in November 2018, to attend the inauguration of the new president Solih, has much to say about the change of intersubjective understanding between the two countries today. More so because this was his first visit to the Maldives after cancelling a scheduled visit during former president Yameen’s term, in 2015. So, what changed? The claim is that the Maldives today has a relatively stronger connection with India as president Solih’s government shares ideas similar to former president Nasheed’s administration which practically favoured India. Ideas have changed. The new government is formed by a coalitional arrangement between former president Nasheed’s party and other opposition political parties that challenged the leadership of the outgoing government. Their political ideas are rights-based and aligned with Western liberal thinking, including the democratic ideas and regional politics promoted by India. This means that the change of foreign policy attitude has little to do with restoring regional power dynamics that was disrupted by former president Yameen’s policy towards China. Rather it was the change of ideas constitutive of new government’s political interests that has re-shaped its foreign policy towards India. Soon after the change in November 2018, former president Nasheed, who was in exile, returned with claims to rethink the Maldives’ relationship with China. The bridge project was originally commissioned to an Indian company during his term. When Nasheed’s government was ousted in the February 2012 coup, that contract was withdrawn, and the project was commissioned to the Chinese government under the OBOR initiative (Rasheed, 2018). The new government’s decision to receive India’s US$1.4 billion aid reflected the revitalised relations between the two countries. This could also be a way of countering the predecessor’s decisions or making new changes. Either way ideas generated and shared by governments have a causal character to shape relations as they interact and socialise for mutual gains. This can suggest that what the Maldives gains from India today will also depend on the intersubjective understanding between them about the type and objectives of gains. This may require India not to interfere with internal affairs of the Maldives even concerning any of its future relations with China. This means that the Maldives’ return to any development partnerships with China will have little to do with India’s role in regional politics. Blyth, M. (2002). Great transformations: economic ideas and institutional change in the twentieth century. Cambridge: Cambridge University Press. Chung, C. P. (2018). What are the strategic and economic implications for South Asia of China’s Maritime Silk Road initiative? The Pacific Review, 31(3), 315–332. Das, K. C. (2017). The making of One Belt, One Road and dilemmas in South Asia. China Report, 53(2), 125–142. Flockhart, T. (2008). Constructivism and Foreign Policy. In S. Smith, A. Hadfield, & T. Dunne (Eds. ), Foreign Policy: Theories, Actors, Cases. UK: Oxford University Press. Ganguly, S. and Scobell, A. (2005). India and the United States: forging a security partnership. World Policy Journal, 22(2), 40. Haibing, Z. (2017). The development and transformation of China’s foreign aid. In M. P. Goodman, D. Remler, & Y. Yu (Eds. ), Parallel Perspectives on the Global Economic Order: A U.S.-China Essay Collection. Washington: Centre for Strategic and International Studies. Jahangir, A. (2013). Changing dynamics of South Asian balance of power. Journal of South Asian Studies, 01(01), 50–58. Rasheed, A. A. (2013). An institutionalist approach to understand the recent political change in the Maldives. LAWASIA Journal. Rasheed, A. A. (2018). Ideas, Maldives-China relations and balance of power dynamics in South Asia. Journal of South Asian Studies, 6(2). Thomas, R. G. C. (2004). South Asian security balancing in a Western dominant world. In T.V. Paul, J. J. Wirtz & M. Fortmann (Eds), Balance of Power. Stanford: Stanford University Press. Yanbing, Z., & Ying, H. (2012). Foreign aid: the ideological differences between China and the West. CIR, 22(2).